Figure 6-48. - A deadman anchorage for a heavy load. The steel picket holdfast shown in figure 6-49 consists of steel box plates with nine holes drilled through each and a steel eye welded on the end for attaching the guy. When you are installing this holdfast, it is important to drive steel pickets through the holes in such a manner that will cause them to clinch in the ground. 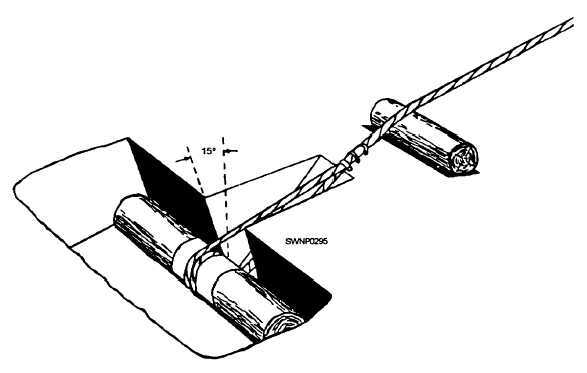 You will find the steel picket holdfast especially useful for anchoring horizontal lines, such as the anchor cable on a pontoon bridge. The use of two or more of the units in combination provides a stronger anchorage than a single unit. A gin pole consists of an upright mast which is guyed at the top to maintain it in a vertical or nearly vertical position and is equipped with suitable hoisting tackle. The vertical mast can be timber, a wide-flange steel beam section, a railroad rail, or similar members of suffient strength to support the load being lifted. The load can be hoisted by hand tackle or by the use of hand- or engine-driven hoists. The gin pole is predominately used in erection work because of the ease with which it can be rigged, moved, and operated, and it is suitable for raising loads of medium weight to heights of 10 to 50 feet where only a vertical lift is required. The gin pole can also be used to drag loads horizontally toward the base of the pole in preparation for a vertical lift. It cannot be drifted (inclined) more than 45 degrees from the vertical or seven-tenths the height of the pole, nor is a gin pole suitable for swinging a load horizontaly. The length and thickness of the gin pole depends on the purpose for which it is installed. It should not be longer than 60 times its minimum thickness because of the tendency to buckle under compression. A usable rule is to allow 5 feet of pole for each inch of minimum thickness. Table 6-2 lists values for the use. of spruce timbers as gin poles with allowance for normal stresses in hoisting operations. Safe capacity of each length shears or tripod is seven-eighths of the value given for a gin pole.